I've been a writer all my life -- perhaps not a successful one, true, but since as early as I can remember, I am someone who writes. A lot. Shopping lists, journal entries, scraps of dialog or anecdote, brainstorming sessions -- it all means I am constantly scribbling. And since about the age of 18, this compulsion has afflicted me with a peculiar idiosyncracy: I never leave the house without some kind of notepad or notebook...and a pen. Of course, in the last 8 months, I have become an addict of the Iphone, so much of my notetaking has migrated to it, especially since, by using its installed "Notes" feature, I can email those scribblings to myself for safekeeping & further development. Still, I get nervous if I don't have a pen and some paper with me, even if it's a little memo book. It can get so bad that, if I do happen to leave the house without my pen & paper, I have been known to stop at a corner store to buy a cheap composition book and a ballpoint just to ease my own clamoring compulsion. It's a sickness, I know. 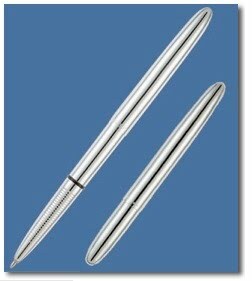 YouTube videos of tests of the Fisher Space Pen's underwater writing ability can be found here and here. Also, a more thorough explanation of the technology behind the pen can be found here, including a test involving baking the pen in a pizza oven and writing through a puddle of WD-40. Impressive stuff, don't you think? You never know when you'll need to jot something down while trapped in a boiling vat of industrial lubricant. Besides their technological superiority over just about every pen I've ever used, another reason I am fiercely loyal to the Fisher Space Pen is (as I've mentioned before): it's a local product. The factory that makes them is in Boulder City, about 20 miles from my house, and I've actually visited it on several occasions. It's housed in a nondescript warehouse just 2 blocks off the main drag. The staff there is always friendly and inviting, and they give an additional discount on anything you buy from their factory store, so it's well worth stopping in. It's my chance to think globally & act locally, right? There is a wide variety of Fisher Space Pen designs, from the Classic "Bullet" Space pen (my favorite) to the cylindrical "Trekker" pens that come with a key-chain ring mounted on their tops to an actual bullet pen made from the brass shell casing of .375 caliber Mag shell (which the company warns should NOT be taken onto airlines because the TSA has confused them with actual ammunition!). The hallmarks of every Fisher Pen design are durable metal construction and that trademark Fisher ink cartridge. The retailer REI sells them because of these unique qualities, which make them perfect for outdoor sports like camping, hiking, and mountain-climbing. My own collection includes a couple of silver Classic Space Pens, a Space-Tec clickable pen I used when I was a wage-slave because it clips neatly into a shirt pocket, and a box of discontinued PR-80 "Rocket" Pens (pictured below) that, I think, were developed as a cheap, disposable version of the Fisher Space Pen. I got a box of 15 of these "Rocket" pens for a buck apiece from E-Bay a few years ago, and, true to form, I've only used up a few of them because they last so long. I guess it's a measure of my personal geekdom that I'm this enthusiastic over a mere pen. After all, most of the people I know use cheap, disposable pens that they replace as needed and never really think about. Hell, if you try hard enough, you can keep yourself well-supplied with all the free giveaway pens you can find in businesses around your area. Banks are the obvious first choice in this department, but the Urgent Care offices that have sprung up at every major intersection are good, too, because they keep large quantities of pens laying around for all the forms you have to fill out every time you visit them. But something must be said for quality. And there is nothing I own that is more durable than the little metal bullet-shaped pen that fits neatly in my pocket (and even more snugly in my hand). My Fisher Space Pen can be counted on to function in any situation, and the smoothness with which it writes matches or exceeds more expensive pens, like the Mont Blanc. The novelist Russell Banks, in an interview I conducted with him that appeared in the Michigan Quarterly Review, talked about switching back-and-forth from word-processing to handwriting to keep his "inner censor" at bay, and I have adopted his approach, switching from typing to handwriting to dictating in order to facilitate the process of composition. It's a kind of artistic placebo, I guess, but it works. And the tactile sensation of pulling out my Fisher Space Pen, opening it up, and rolling its tip across a blank page is deeply satisfying, enhancing the experience of filling a page with conjured words wrung from my fevered brain. So help keep my local economy afloat, and help yourself to Fisher Space Pen. You won't regret it. I've had a Cap-O-Matic for quite some time now. When I first got my hands on it, it wrote perfectly. The lines were defined and the pen wrote smoothly. Now that time has passed (about 2 years of average use) the ink is not as defined and I don't feel it writes smoothly at all. That makes me wonder if I need to replace my pen. Has this ever happened to you? and, when do you know when you need to get a new refill?